I don’t want to jinx myself (yes, I believe in jinxes), so I’m not going to show off my new house until I’m through the inspection period and the loan is approved. However, I wanted to give everyone a sneak peek of what I’ll (hopefully) be working with. I plan on featuring a new room every couple of weeks. 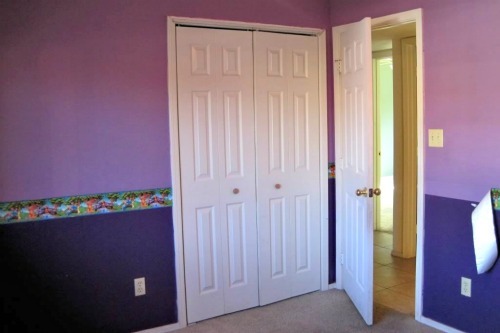 The first room has been appropriately dubbed the Purple Pooh Room (haha! makes me laugh everytime). I’m sure you can see why. This room is 1 of the 3 bedrooms in the house and will likely become my office/gym…and by gym I mean having a treadmill. Lucky for me they did a horrible job hanging the wallpaper border, so it should be easy to remove. My mom pulled that piece loose when we first looked at the house. And yes, the top piece of the closet frame is missing. 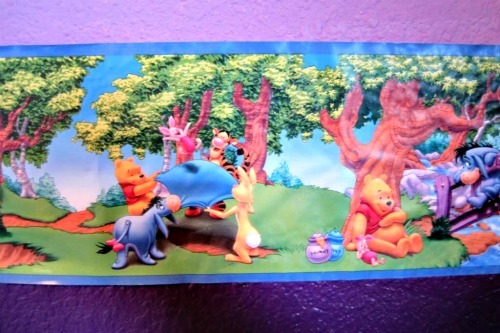 Sorry kid, I’m sure you loved this room, but the Purple Pooh has got to go. Check back tomorrow to see my office/gym plans and inspiration pictures. Wow. You weren't kidding. That is the purplest purple I have ever seen! 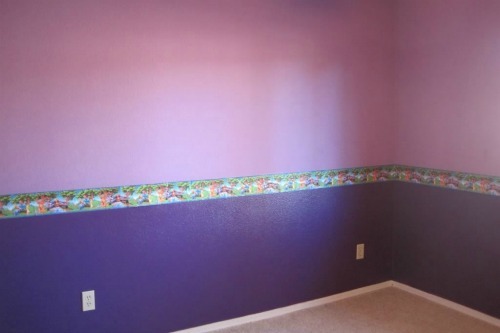 That is an insanely purple room. I think my eyes are bleeding. Thanks so much for following me! I'm you're newest follower! Btw, thanks for leaving me a thoughtful comment.